What is the new Feel Good Protein Water? Feel Good Protein Water is a newly developed product dedicated to weight loss surgery members to supplement protein intake after surgery. Created with the help of many WLS members across Australia and partnered dietitians, Feel Good Protein is the best protein product for anyone who has had bariatric surgery. Nutritionally, Feel Good Protein Water delivers 15g of high-quality collagen protein per serving. What is so great about Feel Good Protein Water? Feel Good Protein is perfect for any weight loss surgery members for 2 main reasons: ingredient and taste. We source the highest-grade collagen from Germany. The unique collagen sourced is a partially broken-down form of collagen protein known as collagen peptides, similar to the technology used in Protein Perfection. The partial breakdown of the protein allows for easier mixing and much greater absorption by our bodies. In terms of taste, we have achieved a breakthrough! Feel Good Protein Water is so tasty it makes you look forward to your protein drink. We wanted to revolutionise the way WLS members consume protein, as an enjoyable experience rather than a task. Feel Good Protein absolutely achieves this vision, and we believe you should try it for yourself! How is Feel Good Protein different to Protein Perfection? Feel Good Protein is built upon the many feedbacks received from users of Protein Perfection. The main difference is the protein used. 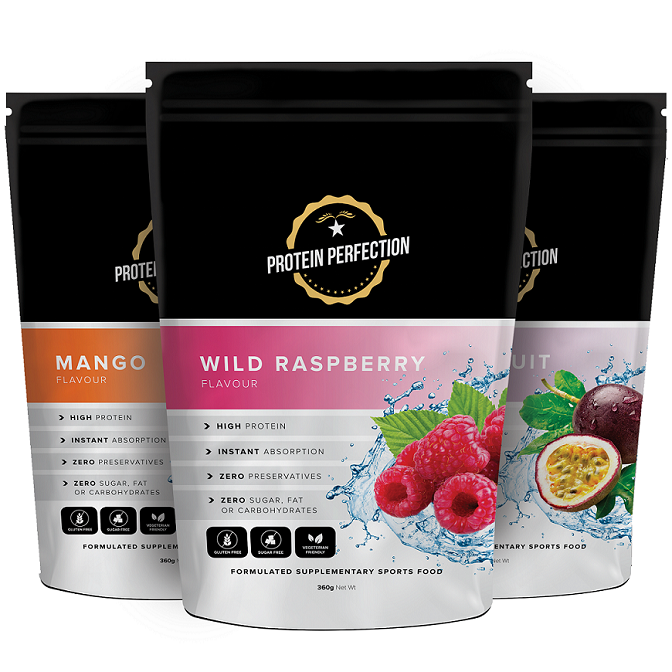 Protein Perfection uses plant based free form amino acids made using a fermentation process. While this is a great natural source of protein, the amino acids took on an unpleasant odour which was difficult to mask. Many members suggested this made their Protein Water experience unpleasant, so we looked to eliminate the “fermented” taste and smell. Using collagen protein as an improvement, we were able to create Feel Good Protein Water – the best tasting protein water available. Protein Perfection is the unique blend consisting of 18 individual essential and branch chain amino acids. It is designed to help supplement the dietary needs of those looking to increase their protein and water uptake. It is especially designed to suit the taste and textural preferences of those who have undergone a WLS operation. What is collagen protein and how is it good for me? Collagen protein is found widely in our bodies. It is a fibrous protein providing our bodies with strength, flexibility and structural integrity. Simply put, collagen protein shines when it comes to firm skin, healthy hair and nails, strong bones and joints as well as improving healthy gut functions. Discover the wide range of health benefits here. What are amino acids/protein and why do I need it? Simply put, amino acids make up protein, and protein is critical for the normal functioning of the human body. Of the amino acids, there are 8 which the human body does not naturally produce. These are known as “Essential Amino Acids” (EAA) and is normally derived from our diet. Protein Perfection contains all 8 EAAs. Unlike carbohydrates and fat, the body does not store excess protein. It has no reservoir to draw from when it’s running low. Therefore, a steady intake of protein day to day is vital. How does Protein Perfection help WLS patients? Protein is naturally found in many food items, but it can be a challenge to eat a variety of protein rich foods every day. This is especially true for WLS patients as many things become hard to stomach. Protein Perfection is designed with the help of many WLS patients over an extensive period of trialling to ensure the taste and texture is the most suited to their needs. This is due to the shift of food preference after WLS, whereby many food items become hard to eat. Even drinking plain water can be a challenge, as it may feel too “heavy” or “bloaty”. Protein Perfection is therefore designed to mix easily into normal water to achieve a taste and consistency of light cordial. It is easy to prepare, drink and even helps with water intake. How much Protein do I need to drink a day? This would depend on the needs of the individual, and independent advice should be seeked from a qualified dietitian. However, for a regular post-operation person, dietitians usually recommend a good protein intake of 60g-80g a day. We recommend that you aim to achieve at least half of your daily protein intake from food sources, so that the other half may be achieved through dietary supplements. To achieve a standard of 15.66g-32.32g of protein from Protein Perfection/Feel Good Protein, usually 2 and up to 4 scoops should be used. Are whey proteins a good option? Proteins such as Whey Protein (Dairy) take time for the body to digest and lose a notable amount of its protein properties during the digestion period. This simply means that only a portion of protein will be absorbed into the body. The digestion period typically ranges between 30 minutes – 3 hours depending on the type of whey protein chosen. Protein Perfection is superior to Whey Protein as a result from the ingredients sourced to build the protein block within the product. The protein makeup is comprised of amino acids which have been “instantized”, resulting in almost immediate absorption into the body without any digestion time or wastage. This results in a very high bio-availability rating of over 95% into the system, all whilst having minimal impact to the digestive system. 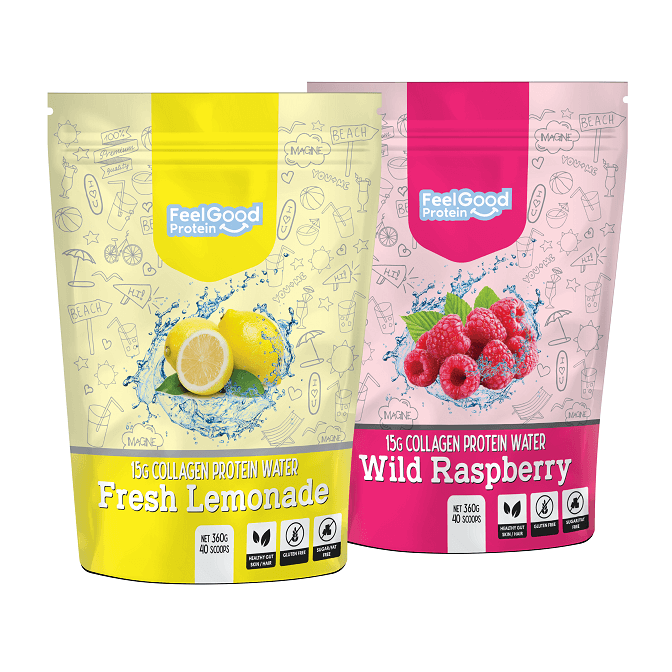 Feel Good Protein uses collagen protein, which on top of offering superior digestability also presents numerous health benefits, many of which are especially helpful for any WLS patient! You can find out more by clicking here. Marine Collagen vs Bovine Collagen, which is better? Marine collagen and bovine collagen constitute most of dietary collagen products. Marine collagen does offer some benefits, such as potentially superior digestibility due to smaller peptides. However, marine collagen is known to have several potential downfalls, including bad fishy aftertaste, high levels of calcium as well as being more prone for allergies. All in all, there is not a specifically “better” collagen, but is rather determined by the quality of the collagen. We made sure to keep a close eye on quality by importing high grade collagen peptides from Germany, and not from large marketplaces such as China where inferior quality ingredients may be found. Using highest quality collagen, we are able to provide a highly absorptive collagen product with no aftertaste nor allergy problems. Does Protein Perfection contain aspartame or other harmful ingredients? Protein Perfection does not contain any harmful ingredients. Aside from the amino acid blend, it also uses standard flavouring, sucralose and citric acid for the flavours. Sucralose (955), this is a registered safe sweetener by the FSANZ (Food Standard Australia New Zealand). The FSANZ set an acceptable daily intake (ADI) for sucralose as 15mg/kg of body weight. This means a person weighing 100kg can consume 1500mg of sucralose safely each day. This amount of sucralose would be equivalent to 10 serves (20 scoops) of Protein Perfection a day. Is the product suitable for me? There are no harmful ingredients in Protein Perfection or Feel Good Protein. However when it comes to dietary supplements, we always recommend seeking professional advice from your general health practitioner to ensure that these products are suitable for you. Generally, Protein Perfection and Feel Good Protein is suitable for all, and contain no allergens other than phenylalanine as these are products rich in amino acids. Feel Good Protein is made using bovine collagen, which is an animal product. However Protein Perfection is a great vegan and vegetarian friendly alternative made with naturally fermented plant-based amino acids. What products do your discount codes apply to? Our discount coupons applies to over 90% of products we stock! The only exceptions are on products we stock for access purposes which we sell at minimal markups. These exclusions are: Boomers 100% WPI, Quest Bars boxes, OptiFast products, WLS Books, Bariatric Plates and samples.